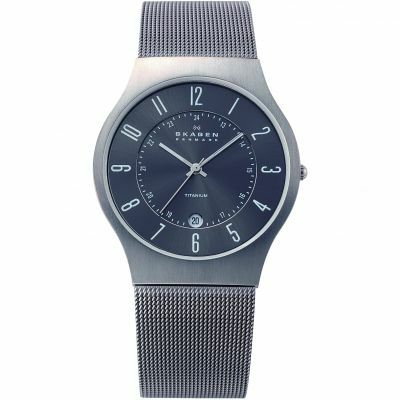 Sleek mens Skagen watch in titanium, set around a blue dial with silver numeral hour markers and a date function. The watch fastens with an understated mesh bracelet. Stylish and easy to wear. This is a slim watch that sits comfortably on the wrist. The blue dial contrasts well with the titanium case with a mesh band connecting seamlessly. A double snap clasp secures it neatly to the wrist without being over fiddly. Date aperture is large enough to be seen but not too large to detract from the overall appearance. On the whole an excellent watch for the money. Very impressed with the Skagen brand. My second from their range and it wont be my last. 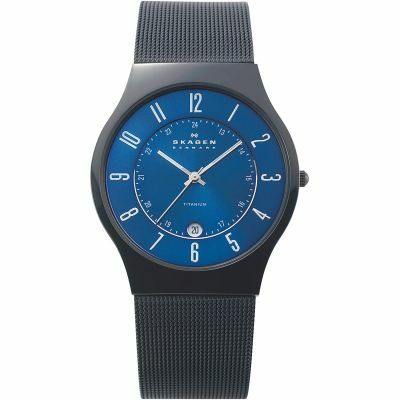 Colour and style exactly what I wanted - replaces previous Skagen which I lost. Very pleased with this puchase, the second Skagen watch Ive owned and certainly not the last. 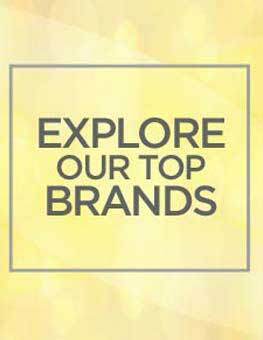 I find these watches excellent value for money, being stylish, robust but lightweight, and way less expensive than many other brands. The service from Watch Shop was excellent, quick delivery with updates on tracking, as well as significantly better pricing than Skagens own website. Excellent value for money. The service was second to none. Ordered on the Thursday and it arrived as promised on the Saturday. It looks very classy and expensive an absolutely beautiful piece . 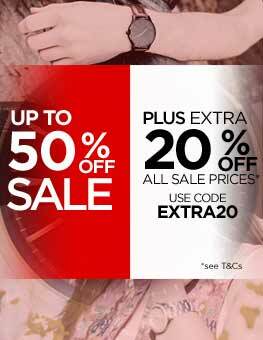 Would definitely buy from the watch shop again and will definitely recommend to my family friends and work colleagues. Ordering and delivery excellent service. Would recommend it to anyone. Delighted with the watch, delivered very quickly and kept well informed on the progress of the order being delivered. It looks even better than the picture on the web site. Easily adjustable strap to ensure a good comfortable fit. An outstanding watch, I brought this watch for my sons wedding and it sits on the wrist beautifully. would recommend this watch.If anybody is thinking of buying this watch do not hesitate. Skagen Titanium Watch. It is very light and comfortable to wear. The adjustable mesh strap is easy to adjust and although I have a small wrist, it fits perfectly without any alterations. I am very pleased with the purchase and would recommend it. Lovely watch. I bought it for my husband as a replacement for his other watch. He is very happy with it. He likes the design, the watch is very sleek. The service from watch shop was excellent, the watch was delivered by recorded delivery next day as advertised. I was not familiar with the brand but I liked the look of the watch the blue dial was clear to read and looked good on. The metal strap seemed complicated to adjust but once the instructions were read was easy enough. It seems to keep good time and is easy to read so it does the job asked of it. It was delivered promptly, excellent packaging and product. Took to Goldsmiths in Milton Keynes for strap adjustment, again excellent service. Very prompt delivery. Bracelet adjustment spot on. Very attractive watch - especially blue face - and bracelet. Appears good value for money. 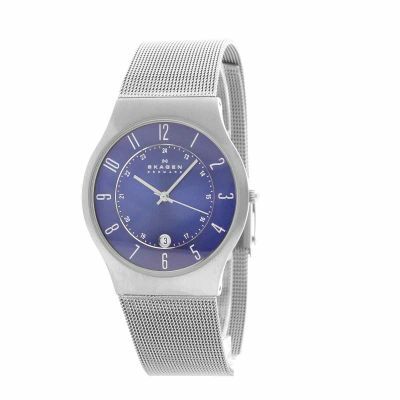 A great Fashion Watch but not sturdy/robust enough for my needs so sadly returned, has lovely blue face but locking clasp on strap weak as came undone on several occasions. This is a quality timepiece, I got this to wear when I am on my motorcycle as the body is very slim and jacket and gloves go over it very easily, but I find that I chose to wear it all the time.The blue dial is much brighter than I expected. I am really satisfied with the purchase and the service of watch shop. Absolutely stunning watch, the face isnt as blue as shown but is in fact a much nicer deeper blue. The face is the prefect size for my somewhat smaller wrist anything bigger than 36mm just looks stupid on me. The numbers and had hands all glow in the dark, and it looks beautiful at night. The body is thin and light, so feels extremely unintrusive on the wrist. I havent had a titanium bodied watch before and find the metal very pleasing to the touch, though it does show grease marks and benefits from a wipe down once a day. The rear of the case can be a bit clammy, but that could be because it is still new. The strap is comfortable and easy to adjust to fit, though the clasp feels a little flimsy it rattles when shaken. It seems to hold time well, and hasnt sped up or slowed down in the time Ive had it. The style is elegant and uniquely, for my watch collection, works in both casual and formal situations. The watch is exactly what I wanted for my partner. 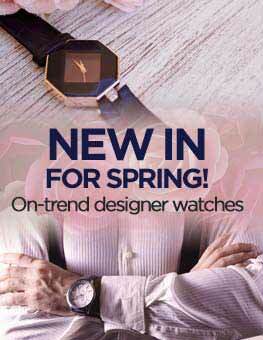 He has seen Skagen watches before and admired the slim and lightweight design. The blue face looks great and makes the watch stand out. The service was fantastic. Delivery really prompt. Bought this for nephews 21st, its a lovely watch, very smart but still casual enough he can wear everyday. After looking for a watch for ages, I came across the Watchshop online. You cant beat them for price or choice. In addition the watch arrived quickly and I was very pleased with my purchase. I would highly recommend anyone to use the Watchsop. Very good watch at a great price. I was looking for a gift to thank my best man for his help with our wedding. He has always loved Skaegan watches but I couldnt quite afford the model he liked. Then I saw it on the watch shop about £40 cheaper than the high Street. This watch looked even better in the flesh than it did in the pictures on the web site. I chose to pick it up from Goldsmiths, it was delivered there the next day. A nice smart looking watch, Not too chunky.The blue face makes it stand out. Excellent service, nice watch, speedy delivery & well wrapped. An excellent gift all-round! My dad is very happy with this as its nice and slim. Package was sent off very quickly and I was kept informed at all times of its wheerabouts. It was very safely wrapped and I received the watch in pristine condition which I loved and it looked exactly the same as the purchase viewed on site. Undoubtedly the most efficient and quick internet buys I have made..well done Watch Shop brilliant! I love Skagen watches and I have this watch with a leather strap but thought I would get it with a metal strap and not disappointed . A really nice watch, looks good, is nice and thin, based on my ownership experience so far Id definitely buy another Skagen. I really like the strap and clasp. Very comfortable to wear. Great looking watch by Skagen. Excellent value. Quality Product. The Blue Style face is extremely noticeable and smart. The titanium strap is very comfortable and light to ware. Extremely pleased with this purchase. Highly recommended. this is a fantastic watch , first had a problem with catch but now perfect.you now want more from me well if fantastic perfect and excellent is not enough then forget it. Very pleased with this watch,looks great on and being very slim and light is comfortable to wear.Delivery was as promised. tired of pulling out my phone to check the time, wanted a watch again. And what a great watch , love the blue face and mesh band together,,,, really, really, slim,, both the face and band. It is not in the way typing or doing anything else, you literally forget it is on your wrist. Really happy with it , been about a year now. It stays spot on time too. The Skagen Grenen Titanium watch was an excellent buy. My son can only wear titanium as he is allergic to most base metals so I was pleased with the selection at the Watch Shop. Having the bright blue face and silver dial/hands make it easy to read, it is very slim so the cuffs of shirts will not catch on it and for the style conscious man it is a must. Also, the bracelet is easy to adjust to the wearers size. Excellent value for money. Excellent service. received item on time. would recommend Watchshop to friends. Super fast next day delivery. was expecting 4-5 days . Bought this watch for my partners birthday and he absolutely loves it despite having numerous watches. This is different because it is so slim and lightweight. The blue dial is trendy and looks really smart, definitely a watch to wear with a nice shirt. Excellent value for money. Would definitely recommend if you are looking for something a little bit different. My husband loves the watch, very sleek! The dial is a great colour and stands out. Strap is easily adjustable and very secure. Amazing watch. My boyfriend is very difficult to buy for so looked for something quite different but simple. Found this and chose this because of the originality of the blue face and strap. He is thrilled with how light it is, not chunky at all and very sturdy so he can wear it every day. Would recommend 100%! Brilliant watch, fits snugly and I think it looks looks pretty classy as well, the contrast between the strap and the dial complement each other perfectIy and give it an understated yet timeless no pun intended! elegance. 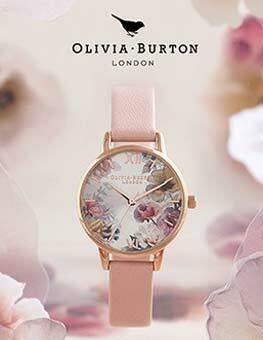 I saw this watch on the QVC channel offered at £109, I liked it so I thought, yeah!, go on, treat yourself!. Just before I bought it I thought id google it on the off-chance that it might be cheaper somewhere else, and lo and behold, there it was for £73 at the Watch Shop! enough said? Nice design, very lightweight and most of all very quiet! I also love the strap. My husband was delighted with his Christmas present. This style is ideal for a slim wrist and looks extremely elegant, the blue face is really lovely, clear and easy to see. He tells me the strap is very comfortable and was easy to adjust to fit. I have been wearing a Skagen watch every day for over 12 years and it has never gone wrong and looks as good as it did the day I got it. That is why I chose a Skagen with its slim casing for my husband. I would recommend it to any one. Outstanding service. Best price on the internet but out of stock when I wanted to purchase. I selected the option to be contacted by text when item back in stock - which worked! Once product ordered, it was shipped same day and delivered next day by secure delivery in time for Christmas. Frankly amazed by outstanding service given - a huge thumbs up for this company from me! Delighted with purchase. Quick delivery at competitive price. Very neat, attractive watch. 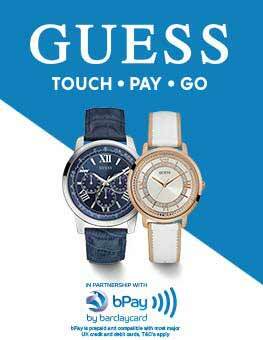 Would use Watchshop again! purchased this as a Christmas present. Skagen design is quite beautiful. my husband has a few Skagens and they never disappoint. the blue face is simple and sophisticated and the strap is well made and easily adjusted to fit. it is a lovely watch im pleased with the price too as i made a good saving on high street price. I wanted a present for my sons 30th birthday & this Skagen watch was perfect. The blue watch face is set off perfectly by the silver strap. The ultra thin body gives the watch an elegant modern style . Get a great watch like me today. Superb value for money the watch is superb and replaces my original Skagen I bought over ten years agoThe dial and date areclear and the 24 hour inner circle is provinguseful. Excellent watch, very good quality, elegant, a pleasure to see it on my husbands wrist. This is a fine looking watch, slim and elegant, with a stainless steel mesh wristband that looks very elegant. The only issue I have with it is the date window is very small, making it quite hard to see the date at a glance. Having bought three Skagen watches in the past, it was an obvious choice to buy a new one for our 40th wedding anniversary. Like the others it is an elegant easy to wear time piece. Its blue face is easy to read. Looking for a watch for my partners birthday and he wanted a titanium watch and I know he dislikes chunky watches, this watch is super slim and stylish and Im sure he will love it. The lovely blue face adds a nice touch, still leaving the watch easy to read. I like the watch ,but I am a little disappointed with the strap ,as the shoulders of the strap stick out to far . I am really pleased with this watch,great looking,verry comfortable to wear.I would buy this brand again,any day. Have always thought that Skagen watches would complement my smart appearence. And now I have one I can say that I was correct. I love the deep blue colour of the watch face, which changes as you tilt the watch from side to side. The mesh bracelet is also quite distinctive. Its very easy to adjust the size to suit your wrist. Everyone thinks Swiss watches are the best, so I like standing out from the crowd by having some Danish design on my wrist. This watch was bought for my husbands 70th birthday and hes delighted with it. Its very light and comfortable to wear and looks really good on. Its the most trendy watch hes ever owned yet really doesnt look inappropriate on a 70 year old! The blue dial and silver coloured numbers are easy to read - another important consideration when buying for an older person. However, dont assume its a watch for older people - our very fashion conscious sons and grandsons really love it too. The easy but flexible bracelet fastening is excellent as we sometimes have difficulty getting a bracelet to fit someone with large hands but relatively thin wrists. It threads and clips into the desired position so weight gain or loss would make no difference to the fit. Overall, a good looking watch that I would recommend for any age group. 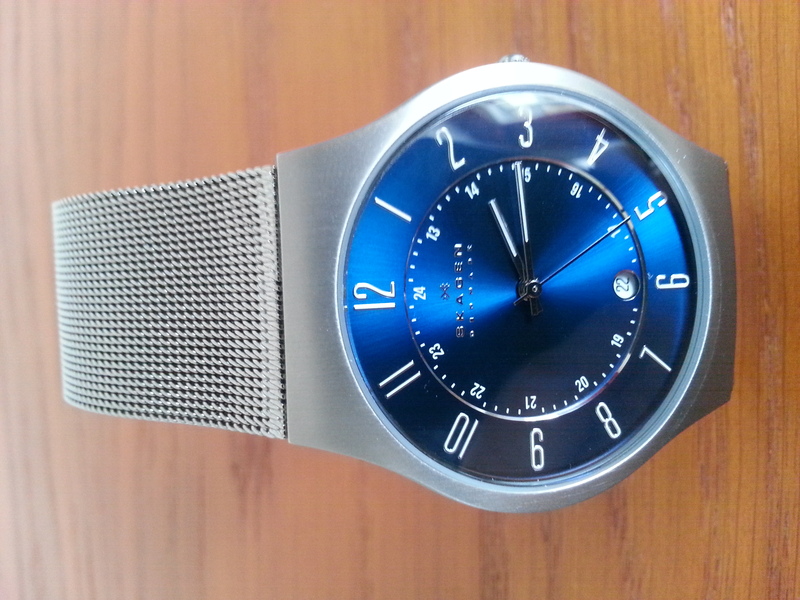 Purchased my Skagen Titanium watch because of what I perceived to be its understated design when viewing. It did not disappoint and if anything looks even better than the images depict. Really impressed! Whilst the watch is understated, it is also very eye catching with several colleagues commenting and asking where I purchased the watch from. Gorgeous watch, stunning strap, loved it, the blue dial colour was just perfect. Have just realised that I reviewed the wrong watch. This is the watch that I bought. I like the way the watch feels when I wear it, it is slim, light and very comfortable. I like the look of the watch it is stylish and easy to read. This is the most expensive watch that I have bought and it is well worth the money. I was expecting the watch to be made in Denmark and was surprised to find that it was made in China. I like the feel of the watch when I wear it. It is very slim and light. I like the the adjustable bracelet, I adjusted it myself after following the instructions in the manual. It is very stylish and is easy to read. Ive only had it a few days but am very pleased with it. This is the most expensive watch that I have bought but it is well worth the money. I was expecting it to be made in Denmark and was surprised to find that it was made in China. It is well made and I would consider buying another one. Really pleased with the watch, the face looks a little less blue under normal light than in the display picture which I think is quite a plus, and the numbers and hands have a very sharp finish. The strap is well made and makes the whole watch feel light and easy to wear. The only compliant I can really make about this watch is that the clasp took a few days getting used to and was quite difficult to remove from my wrist, however, this was probably because I am not used to a clasp. I was looking for an unusual watch as a christmas surpries for my partner, who can be a bit fussy when it comes to watches, when this arrived i was impressed with the design and workmanship of the watch it looked expensive and the blue face really stood out, Also the strap makes this really different from other watches i have seen on the high street. I was impressed at how light this watch is. I showed it to my father who at 73 has great taste and has informed me that if my other half does not like it he will happliy take it off his arm. have to say v v impressed and also servise was great!! Think i will have to purchase one for my father as i cant see my other half giving up this watch. Very stylish and beautifully made, particularly like the slim body which doesn't get caught on shirt sleeves and the mesh bracelet is an engineering masterpiece. the watch was a present and was loved. it was exactly as it looked on the web. there was nothing to not like about the watch. looks really good with a grey/silver strap, really shows the blue face off well. beautifully crafted and sits really nicely on the wrist. excellent clasp, designed to not unclip. Bought this for my partners birthday. He loves it, very slim, elegant and light weight.